In the run up to what will be a defining moment for the Catholic Church in Calcutta, when the city’s celebrated ‘Saint of the gutters’ will be elevated to an ‘official saint’ of the Church, the city at large is going sentimental. People in Calcutta celebrated the birthday of Blessed Mother Teresa days before she is scheduled to be canonized on Sept. 4. 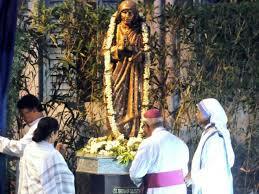 A statue of Mother Teresa was at Bishop’s House in Kolkata by West Bengal state chief minister Mamata Banerjee. West Bengal Chief Minister Mamata Banerjee, who unveiled the statue, commended the “bold and historic decision that the Archbishop House has a statue of Mother Teresa before her canonisation.” Ms. Banerjee said that she had accepted an invitation from the Missionaries of Charity to visit Rome during Mother Teresa’s canonisation on the very day on which results of the last Assembly elections were declared. “I am not going with the official Government of India delegation but as a guest of the Missionaries of Charity,” she said, telling the small audience gathered at Archbishop House that she will wear a sari in colours similar to those worn by the nuns of the Missionaries of Charity. The Chief Minister recounted her meetings with Mother Teresa, sharing anecdotes about how Mother Teresa went about serving the poor and downtrodden in most difficult circumstances. “Mother Teresa made it clear that there is no substitute for good work, work for the downtrodden and work for humanity,” Ms Banerjee said, describing Mother Teresa as the ‘Pride of Kolkata’. Mother Teresa will be declared a saint on September 4. August 26 , the Mother’s birthday started with Mass attended by the over 300 co-workers, volunteers, laypeople and nuns of the Missionaries of Charity, the congregation Mother Teresa founded in Calcutta, to serve the poorest of the poor. Archbishop Thomas D’Souza of Calcutta, said Mother Teresa’s life was one of sacrifice and love, empowered and strengthened by her faith. The city is also hosting the fourth Mother Teresa International Festival, showcasing 23 films from 15 countries exclusively on Mother Teresa. “The objective of this festival is to spread Mother Teresa’s message to the world, raise awareness and sensitize people about her work and good deeds,” Sunil Lucas, SIGNIS India president said. Mother Teresa was born in Skopje, now the capital of Macedonia. She died of cardiac arrest at the congregation’s motherhouse in Kolkata on Sept. 5, 1997, aged 87. Her canonization process began two years afterward. One Response to "Bengal CM says Mother Teresa is ‘Pride of Calcutta’"
She is the Symbol of humanity, I really adore her. one of her lines i want to say don’t wait for leaders do it alone .